The Phillips curve seems to offer policymakers a menu of possible inflation-unemployment outcomes. But does this menu of choices remain the same over time? Is the downward-sloping Phillips curve a stable relationship on which policymakers can rely? 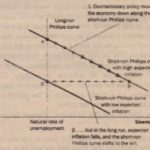 Economists took up these questions in the late 1960s, shortly after Samuelson and Solow had introduced the Phillips curve into the macroeconomic policy debate. 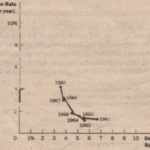 In 1968, economist Milton Friedman published a paper in the American Economic Review, based on an address he had recently given as president of the Amen can Economic Association. The paper, titled The Role of Monetary Policy,contained sections on “What Monetary Policy Can do and What Monetary Policy Cannot Do. Friedman argued that one thing monetary policy cannot do, other than for only a short time, is lower unemployment by raising inflation. At about the same time, another economist, Edmund Phelps, also published a paper denying the existence of a long-run trade-off between inflation and unemployment. Friedman and Phelps based their conclusions on classical principles of macroeconomics. Classical theory points to growth in the money supply as the primary determinant of inflation. But classical theory also states that monetary growth does not affect real variables such as output and employment; it merely alters all prices and nominal incomes proportionately. 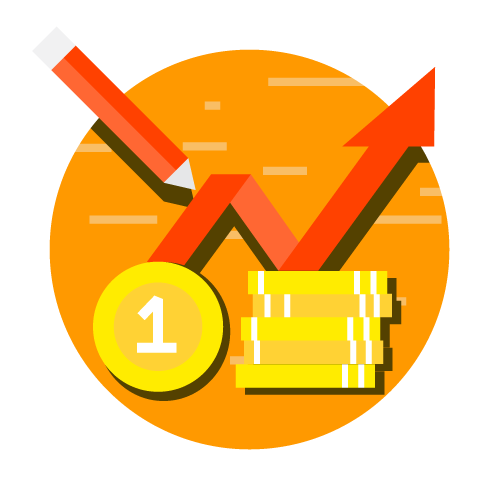 In particular, monetary growth does not influence those factors that determine the economy’s unemployment rate, such as the market power of unions, the role of efficiency wages, or the process of job search. Friedman and Phelps concluded that there is no reason to think that the rate of inflation would, in the long run, be related to the rate of unemployment. unemployment, the level of real national income, the real quantity of money, the rate of growth of real national income, or the rate of growth of the real quantity of money. These views have important implications for the Phillips curve. In particular, they imply that monetary policymakers face a long-run Phillips curve that is vertical, as in Figure 3. If the Fed increases the money supply slowly,the inflation rate is low, and the economy finds itself at point A. If the Fed increases the money supply quickly,the inflation rate is high, and the economy finds itself at point B. In either case, the unemployment rate tends toward its normal level, called the natural rate of unemployment. 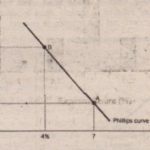 The vertical long-run Phillips curve illustrates the conclusion that unemployment does not depend on money growth and inflation in the long run. According to Friedman and Phelps, there is no trade-off between inflation and unemployment in the long run. Growth in the money supply determines the inflation rate. Regardless of the inflation rate, the unemployment rate gravitates toward its natural rate. 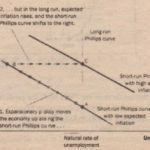 As a result, the long-run Phillips curve is vertical. 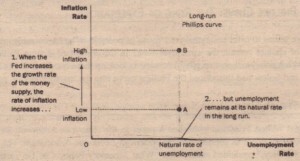 The vertical long-run Phillips curve is; in essence, one expression of the classical idea of monetary neutrality. Previously,we expressed monetary neutrality with a vertical long-run aggregate-supply curve. Figure 4 shows that the vertical long-run Phillips curve and the vertical long-run aggregate-supply curve are two sides of the same coin. In panel (a) of this figure, an increase in the money supply shifts the aggregate-demand curve to the right from ADI to AD2• As a result of this shift, the long-run equilibrium proves from point A to point B. The price level rises from PI to P2 but because the aggregate-supply curve -‘ vertical, output remains the same. In panel (b), more rapid growth in the money supply raises the inflation rate by moving the economy from point A to point B. But because the Phillips curve is vertical, the rate of unemployment is the same at these two points. Thus, the vertical long-run aggregate-supply curve and the vertical long-run Phillips curve both imply that monetary policy influences nominal. Panel (a) shows the model of aggregate demand and aggregate Supply a vertical aggregate-supply curve. When expansionary monetary policy shifts the aggregate-demand curve to the right from AD to AD2 the equilibrium moves from point A to point B. The price level rises from to P2 while output remains the same (b) shows the long-run Phillips curve, which is vertical natural rate of unemployment. Expansionary monetary policy moves the economy from hyperinflation (point A) to higher inflation (point B) without changing the rate of unemployment.